Born in London, 1959. Studied Music at London University, violin with Clarence Myerscough at the Royal Academy of Music. Taught piano by John Tilbury, electronic music by Hugh Davies & in 1982 participated in seminars & performances directed by John Cage. Over the past 25 years he has worked internationally as an improvising violinist, interpreter, solo performer and composer for dance, theatre and film (with Sasha Waltz, Rose English, Corinna Harfouch, Anzu Furukawa a.o.). From 1996 - 2003 he was resident in Berlin. His latest work combines instruments and machines from the pioneering era of sound recording and reproduction (horned violins, wind-up gramophones, shellac discs and wax-cylinder phonographs) to make live mechanical-acoustic music. Since 1999, he has actively explored the potential of pre-electronic sound reproduction technology in live performance. This work has been shown in Europe & the U.S.A., and broadcast on the BBC, WDR & Deutschlandradio stations. In 2002 he founded Recording Angels, a series that examines our relationships to recorded sound using antiquated recording devices such as phonographs and acetate record cutters in performances and installations. Projects include "voices & etchings" for 6 singers and gramophones (staatsbankberlin, 2003, Klangraum Krems, 2004) & "Mechanical Landscape with Bird" (2004, MaerzMusik), featuring live singing canaries, wax cylinder phonograph recordings and a rotating horned string quartet. In 2006/7 he composed "What hath God Wrought?" for stroh string quartet performed by Apartment House & broadcast by BBC Radio 3. His "Recordette" (2007) was a marathon record cutting, installation event for Transmediale.07, Akademie der Künste am Pariser Platz, Berlin. 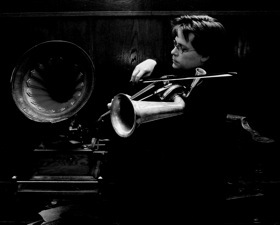 He has amassed a significant collection of historic horned "Stroh" instruments, including a complete string quartet, which feature large in many of his projects. Collaborations with artists include: Martin Riches, Apartment House, Kairos Quartett, Ute Wassermann, Anna Clementi, Aki Takase, Tony Buck, Hayley Newman, Phil Minton, Tristan Honsinger, Tony Oxley, Evan Parker, Sainkho Namchylak, Louis Moholo, Jon Rose, Matt Wand, Richard Barrett, Phil Niblock, Christian Wolff, Nic Collins, Claus van Bebber, Boris Hegenbart, Stephan Mathieu, Paul Panhuysen and many others. He has recorded for numerous labels including Emanem, psi, FMP, Soul Note, A&M, Island, Leo & Dossier. He is based in London.